All the big, important cars get commercials, but what about the little cars? What about the obscure, forgotten autos? They got commercials, too, you just never saw them. I know you're all probably trying to forget that even the regular Chevy Cavalier existed, but there was also a Toyota version, sold in Japan. Of course it got its own bizarro spot. This thing got a Super Bowl ad and still nobody knows what it is. Japan is inundated with tiny vans, and this one gets the nod, probably because it has the best name ever. Even Cadillac is probably trying to forget that they rebadged a Saab 9-3 and tried to pretend it fit the Standard of the World. Only the European market got to see this spot. No, that's not a BMW M5 ad. Australia's own sports car: it looked good, had a V8, and was named like some kind of intestinal disease. Only 118 were ever sold, but not before they made this promotional spot. I know all of you Isuzu and/or Chevrolet Spectrum fans out there are screaming, but the Gemini isn't obscure at all!Well, the car deserves an inclusion on this list, if only for the strange story of this ad, which weaves itself into the history of the Internet itself. The Isuzu Gemini home market "Dancing in Paris" advertising campaign dating 1985-1992 featured the stunt driving of the Remy Julien team in 2nd and later 3rd generation Geminis, set to classical music. 100% Real stunts with no computer animation. Precision driving that would make a Shriner cry. Jumping cars, buses, fountains, rivers. Driving through the subways and over roller coasters. Saab and others would later copy the ads. And many years later the Gemini ads would later be remixed and set to the dance song "She Moves", posted to Youtube, and it became one of the first viral videos on the internet. If any of you even remember an ad for the Buick Skyhawk at all, I'd be impressed. 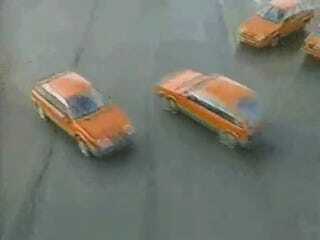 But the Skyhawk Turbo Hatchback ad is particularly hard to recall, as N2Skylark explains. The hatchback body was only offered for 1986-87, and the turbo 2.0L only in 1987. Very, very few were sold. Most people don't even know Buick offered a J-body Skyhawk hatch, much less with a turbo. The Renault Medallion was orphaned even faster than the Skyhawk Turbo Hatchback. Midway through the year the car was renamed to the Eagle Medallion, and it was like the Renault version never existed. Even the Eagle name died ten years later. And yes that's George C. Scott narrating. Behold the Cricket, the car that never existed. Well, everyone believes it was made, just nobody's ever seen one, as Jonee explains. Here's a rebadged Hillman Avenger sold here as the Plymouth Cricket. I love and seek out weird and obscure cars and I've never seen one of these in person. It predates me, but not by much, and I don't remember seeing them when I was a kid, so yeah, they must not have sold many. Or, they disintegrated really fast, which is probably also true.